...for Christmas parties! My department at work had a Christmas lunch at Maggiano's. Did you know that Maggiano's means "oversized portions to help you gain 10lbs between Thanksgiving and New Year's"? I know, it's amazing they could fit such a thought in one word, but those Italian's are sneaky. That same night, we hit up the FS Series Holiday Party where Marty received a special present from Jason and the gang - a Shake Weight. They were all, "This is why Marty is one of the fastest triathlon swimmers in the area" and "Powerstroke!" If you have not heard of the Shake Weight, I suggest you push that rock out from over your head. But I'll also put the commercial up for you, since it is Christmas time and I'm feeling generous. Okay, enough talk about how I'm going to have AMAZING arms in just 6 minutes. 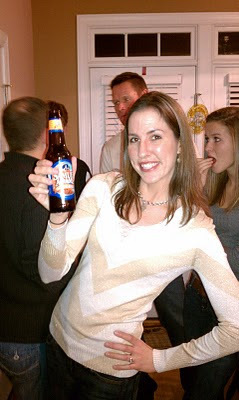 Friday night was spent with some good friends and Saturday was chock full of Holiday Spirit. We started the night with the TAF group at Cafe Caturra before heading over to the main event - Nas's Christmas party. This party features a very popular white elephant gift exchange. 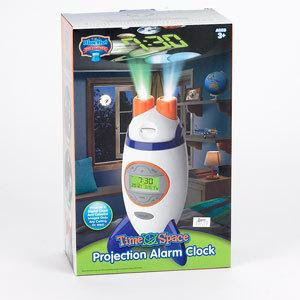 We ended up with a space rocket projection alarm clock. Honestly, it's really cool. The person who brought it had told her husband beforehand, someone is either going to think this is totally stupid or some geek is going to love it. Huh. I did find an Sam Adam's Oktoberfest in the fridge. Yeah, I don't care that it's December and this beer was probably made 3 months ago. It's my FAVORITE Sam Adam's beer. And everyone knows that their Oktoberfest only lasts for about a month and a half while their disgusting Winter Lager lasts until March. It was like my birthday finding this gem in the fridge. Or maybe like Christmas. Now every time I see the shake weight commercial I am bound to bust out in childish giggling! ;) Yeah for party fun! We saw that shake thing on TV and I said, 'that is stupid." Jerome says, 'I don't think that is that bad...it probably does work?" WHAT? did your IQ just drop 100 points during the infomercial? Anyway....hope Marty enjoys that and you enjoyed that beer. Jerome is a member of BEER of the month and he gets all these fun, fabulous beers (too bad I don't like beer...)! I like the alarm clock. My current clock is broken and I have to reach over and pick it up to check the time. Also sorry we missed you guys at Nas'. Remy decided he was ready to go before you got there. p.s. Shake weight SNL skit is pretty funny. They still have some funny stuff every now and then.